Fiji Airways Fiji 7s team Head Coach Gareth Baber is expected to finalise the travelling team for the next two HSBC sevens tournaments today. The team for the next two tournaments in Hamilton and Sydney may be boosted by the return of Josua Kurunabili and potentially Paula Dranisinukula (Sydney), with coach Baber facing a tough selection in the forward line. The HSBC Hamilton 7s kicks off next week on January 26 and 27. This year’s Hamilton 7s will feature sixteen teams competing over two consecutive game days at FMG Stadium. Our Fiji Airways 7s team are drawn into pool A with Australia, Argentina and Wales while the current series leader USA is in pool B with England, Samoa and Tonga, who have won a spot on the Hamilton 7s and will be making their comeback after almost 5 years. 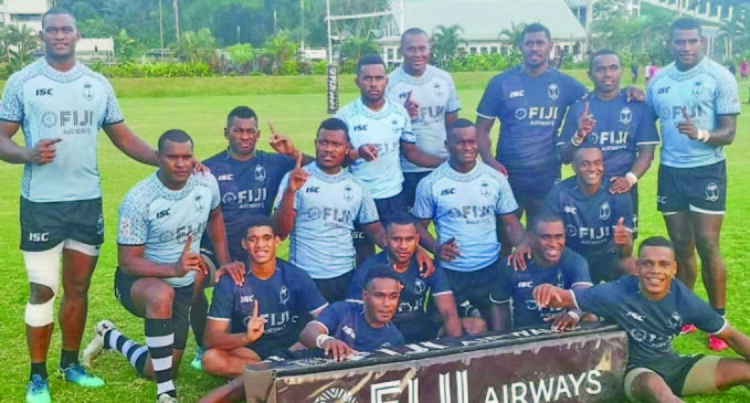 The Fiji Airways Fiji 7s team have been bunkered down in camp this week as preparations for the New Zealand 7s in Hamilton start to taper down. Playing a training match against the touring Hong Kong team in Sigatoka, the side was able to finalise much of the game scenarios and combination work Baber has been drilling the team over the last four weeks of training. Teamed with another signature session at the sand dunes on Wednesday morning, the Fiji squad are looking pretty good heading into the next two ‘local’ tournaments, where they’ll be chasing another win in Hamilton and a boost to their current third place standing on the tournament ladder. As has been the case across the entire 2019 pre-season, Baber again has been impressed by the endeavor shown from fresh faces into the squad including the likes of Napolioni Ratu and Terry Timani as the youngsters push for a ticket on the plane next week. Meanwhile our Fiji Airways Fijiana team is also in preparation for the Sydney 7s which will commence from the 1st to the 3rd of February. The Fijiana is sitting at pool B with Canada, Russia and Ireland. Head Coach Saiasi Fuli has taken the Fijiana Development Squad to the Coral Coast Sevens with the team starting off strong against Outrigger Knights (40-0) and Lautoka Crusaders (47-0). The Coral Coast 7s tournament is providing an excellent opportunity for Fuli to put his team through match intensity and work on the combinations and fundamentals he’s been focusing on for the last few weeks.